SGA has continued to make significant strides toward ensuring a reliable and sustainable groundwater basin for future generations and advancing successful implementation of the Water Forum Agreement. With available monitoring and management tools, SGA has had a solid foundation for managing the basin. 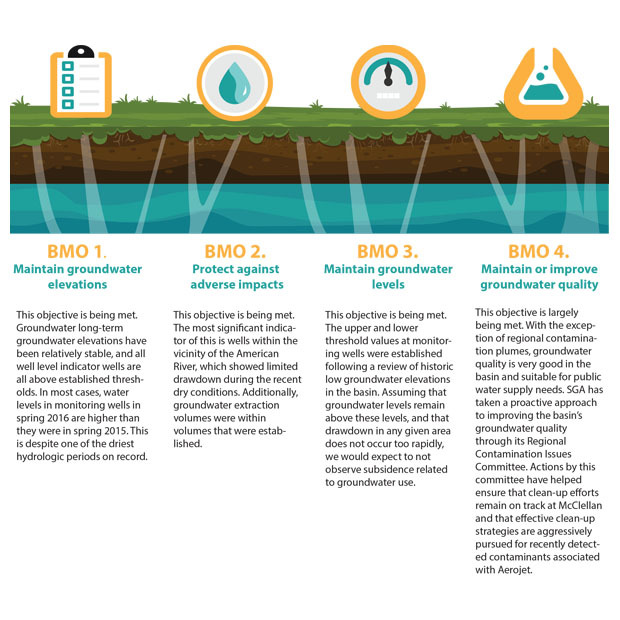 SGA has established the following Basin Management Objectives (BMOs), as well as quantifiable indicators that could be used to evaluate if the objectives are being met. Maintain groundwater elevations in the SGA area that provide for sustainable use of the groundwater basin. Protect against adverse impacts to surface water or groundwater resulting from interaction between groundwater in the basin and surface water in the American River, the Sacramento River, and other surface water bodies within the SGA area. Maintain groundwater levels to prevent inelastic land surface subsidence that would damage infrastructure or exacerbate flooding. Maintain or improve groundwater quality in the SGA area to ensure sustainable use of the groundwater basin.